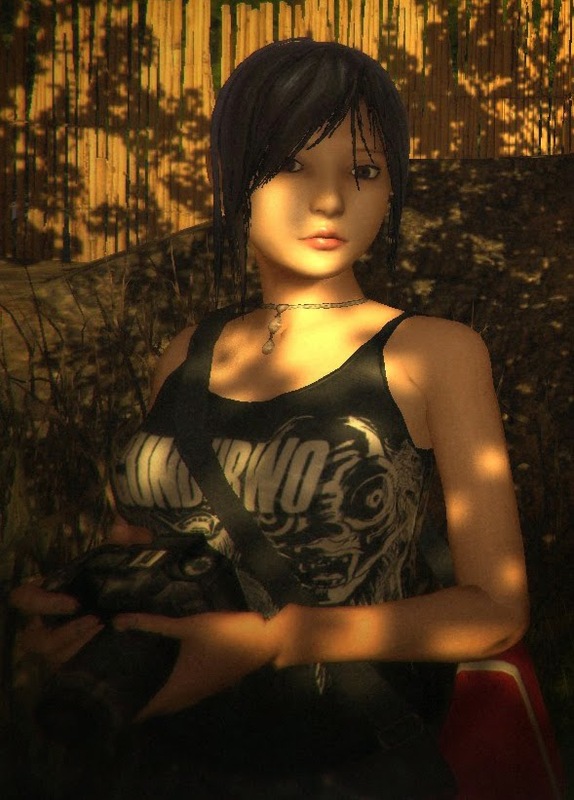 If you followed me on Twitter for the last week, you might have noticed I developed a slight obsession with the Indonesian indie horror game DreadOut (which I hear is a pretty big deal over there) and its main protagonist Linda Meilinda. I connected with Linda as a character early on because I entertained the thought of her being an actually mute protagonist rather than just a silent one and I found that interpretation charming. So if you'll allow me, I'll attempt to talk you through the thoughts I had related to those concepts. The idea behind having a silent protagonist is generally so that the player can project their own interpretation of what the character should be like on them as a form of identification, as if they were a blank piece of canvas that the player gets to fill in. It makes sense since, just like how in horror nothing is scarier than whatever your own mind concocts, so would you probably be more likely to identify as (or simply like) a character that you get to fill in the blanks for yourself. The character does have the ability to speak, we simply aren't shown their textbox or hear their dialog because those could break our idea of what the character is like. "I mean, by having the voice actor speaking out the main character's opinions and messages, I'm afraid that they are going to narrow down the actual characteristics that people can imagine or apply to each character they are controlling, for example." Alternatively there is the possibility that the silent protagonist is simply mute (which I suppose is in itself a way of filling in the blanks). Personally I think this interpretation works nicely for Linda as a character, although I don’t think a really solid case could be made for either option short of a statement from the developer. However the primary tool and weapon of the game being a smartphone (technically an IrisPhone) and the irony of an apparently mute person wielding a phone of all things did make me wonder how such a character could be handled, which in turn made it an interesting thought experiment for me personally since I myself am trying to insert a mute character into a story. I guess I won’t just be attempting to make the case for why Linda could work as a mute character, but also why her phone is such an invaluable object to her that she’ll rarely put it away (even before the ghosts show up). This with the intention of dissecting how these characters are developed right now and brainstorming a bit on how actual mute characters could be inserted in fiction in the future. 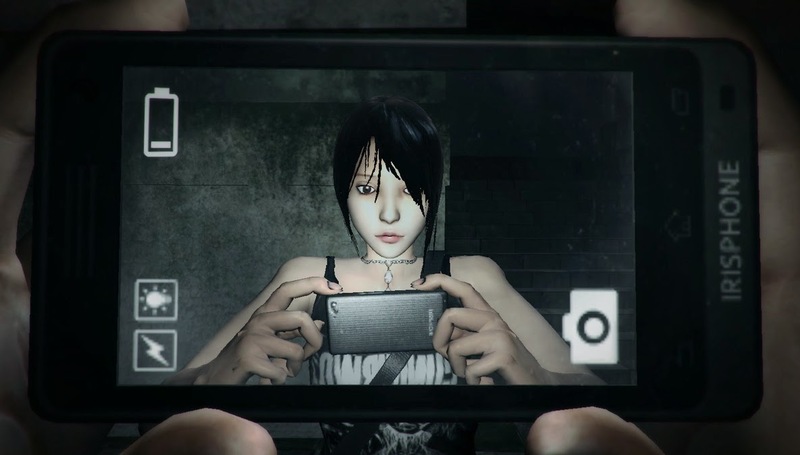 In DreadOut the IrisPhone functions as both a flashlight and as a method of fighting off ghosts because somehow they are shy about having their picture taken (perhaps Linda's innate psychic powers are simply channeled through taking pictures). In a haunted village at night that by itself would make it invaluable. However to a person incapable or unwilling of speech, text messaging would also be a great tool to help with communication. This isn't explicitly shown in the game since, again, most of this is just me filling in the blanks of a silent protagonist for a certain “what if” scenario. During a section in Act II where you get to communicate with a (somewhat playful) ghost through a possessed Ira, it appears as if Linda is asking questions and leading the conversation down certain paths. This plays out from a first person perspective so we don’t see (or hear) Linda talking but of course we automatically assume that she is. What if she was actually typing out messages on her phone for possessed Ira to see? If Linda relies on her phone as a primary method of communication it would explain her attachment to it beyond the phone culture we find ourselves in. She's simply naked without it. That's a rather cool idea for a silent character, isn't it? I suppose a possible counterargument to Linda being mute is a brief scene during the reunion with Shelly where Linda makes an apparent attempt to respond vocally before being interrupted. Of course as this is the only scene in the game (that I caught, anyway) where Linda makes a seeming attempt to talk, this could simply be an example of "expressive silence" which I will briefly discuss next. The actual counterargument would probably be Shelly expecting a response though. If we assume she just fired of a barrage of questions due to panic over the situation and relief of seeing a friendly face however we can just as easily put this scene along with the others where none of the dialog implies that Linda somehow responded. There's a certain paradox in having a (non-mute) silent protagonist in a third-person horror scenario, which requires the character having a visible reaction to their surroundings to be effective. It would be standard bravery in a regular third-person action game but for a horror game our own fear requires a certain vicarious connection to the protagonist and their fear. As such we can't just have Linda be completely emotionless while ghosts pop out with the intention to scare her. This means we still have a window into the character's personality, they just don't vocalize that personality. That makes it one aspect of the character we are supposed to identify with on which we can't project our own ideas. Rather like how Link from The Legend of Zelda is supposed to be the player's link into the world of Hyrule, yet the designers opted for a cartoony style for Wind Waker so they could better show his reactions. There's nothing bad about doing things like that but it feels rather self-defeating and it naturally leads people to wonder if the character is supposed to be mute rather than be a reflection of themselves. Linda does this too with big gestures whenever she interacts with her friends. She might not actually be speaking, but that doesn't mean she doesn't say anything. She makes hand gestures to mock Ira for speaking too much, she grabs her cheek after being slapped, she sulks when being teased, chokes Ira in jest and makes a pondering gesture when Ira starts reminiscing. That's her way of communicating with her friends without actually vocalizing. Humorously enough the one emotion she doesn't really show a lot of is fear, which I suppose adds to her backstory that she once threw a rock at a person disguised as a ghost while her friend was just scared. We can easily imagine what kind of a person she is even though she hasn't spoken a word. Of course that still doesn't mean Linda was supposed to be a mute character, but perhaps developers themselves naturally attempt to compensate their protagonist's silence by proxy by exaggerating their characters' physical responses. Also she's just really cute. Coincidentally I read Deus Ex: Icarus Effect a couple of weeks ago featuring a character who has muteness as a character trait. Yelena Federova (spelled Fedorova in Human Revolution) is a Tyrant assassin who is implied to be able to speak, but simply hasn't in a very long time, probably due to trauma. The story is told from the perspectives of Anna Kelso (who is a target of the Tyrants) and Ben Saxon (who is a Tyrant). This means we get to see the Tyrants both as being scarily effective assassins operating in complete secrecy, and as the broken people they really are (exception being Jaron Namir, who has his stuff together so well that it offends Saxon he is allowed to have such a normal life). So on one side we see Yelena as an assassin operating from the shadows (with cloaking technology, no less) with her muteness being just another factor that enhances how intimidating she appears to Kelso. She is being hunted by an assailant who is difficult to read and one who would be hard to reason with. On the other side the exact same character traits are simply evidence of a broken person whose muteness is the result of trauma and probably acts as a self-defense mechanism. I personally loved DreadOut and its protagonist Linda, however it is a pretty hard game to simply recommend. The difficulty of some of the puzzles is such that you occasionally have to remember environmental details (or take pictures and save them to your gallery) long before they become relevant, and thus likely having missed them. Other puzzles are simply so obscure it required me to consult a walkthrough quite often. These puzzles clearly make sense from the developer's point of view but a bit more playtester input could have been useful (or I'm just bad at these sorts of games). There's also still a fair share of bugs and translation errors that need to be fixed (and a character is named Doni in Act I and Donny in Act II). These things could be frustrating or throw you out of the experience so keep that in mind. If the entire above article wasn't enough of an indication, I really love DreadOut's protagonist Linda Meilinda and despite them not being all that developed, I also came to care for her friends. The somewhat weaker gameplay is compensated by how well-crafted all the scenes, atmosphere and character models are (relative to the game's budget and status as an indie game, of course). The game's story is rather confusing but this being a horror game, that ultimately helped in keeping the game in my mind trying to figure it all out. Act II even gives you a bit of player choice regarding the outcome of the story. All in all, I did love the game, but you should keep in mind that it's still a fairly unpolished indie title. Playtime to completion: roughly 5 hours to complete Acts 0, 1 and 2. The Soundtrack & Manga DLC also includes several costumes to use in game, as well as the ability to switch costumes right away (otherwise requiring you to have finished the game already). As I made clear multiple times, I'm not so much attempting to show that Linda Meilinda is a mute rather than simply a silent protagonist, but I hope I've shown that she could have been very easily pushed in that direction had the developers decided to go that route. Perhaps for DreadOut it would have even made more sense to have her be an actual mute. Even if you dismiss this as mere pointless fan theorizing, at least I hoped I provided you with some insights.